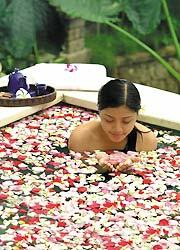 Bali Spa It takes 5 minutes by car from center of Ubud. 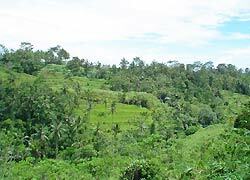 The Spa at Kori Ubud is attached to the Kori Ubud Resort surround by rice filed. Offers two rooms for individual massages and one room for couple massages. By the request, guests can take treatment on the pool-side. Aroma therapy is using only the finest natural ingredients. Every body has Chi, or energy and this specialised massage aids in relieving tension, headeches and Muscle fatigue, help improve the blood flow thereby assisting all internal organs. This anciant technique is also known as Reflexology, using Fresh oil. A refreshing and stimulating massage oil to ease muscular strain, improve circulation, release depression, reduce shock and overcome mental and physical exhaustion. 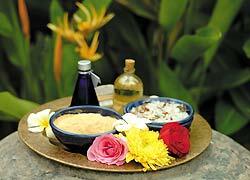 Aromatic massage to heighten sences, energise the body and stimulate the soul. Using Relax oil. A shooting massage blend which calms and relaxes all aspects of body, mind and sprit. Appeals both men and women. This Traditional massage has been passed down through generations and we wish for you to experience the full Traditional of being pampered in Bali. This traditional Balinese technique is also using a combination of stretching, acupressure, Swedish and Hawaian, Lomi Lomi massage technique. Balancing and grounding, this oil promotes hraling and harmony throughout the body, mind and spirit. Combine the manicure and traditional facial. Enjoy a popular Traditional Java beauty treatment started with Jacuzzi, thallaso foot bath, Lavender body wash, turmeric body scrub plus the splash yoghurt body moisturizer, shower, flower bath, aromatic essential oil massage, refreshing baverage and healthy jamu. This traditional spa pacakge is begin with aromatherapy flower foot bath, followed by aromatic essential oil massage, your choice of 3 kinds exotic body scrub & body moisturizer, shower, flower bath, aromatic essential oil massage, refreshing baverage and healthy jamu. A heavenly traditional spa treatment starting with Jacuzzi, aromatherapy flower foot bath, Lavender body wash, our choice of3 kinds exotic body scrub & body moisturizer, shower, flower bath, aromatic essential oil massage, traditional facial, manicure or pedicure, refreshing baverage and healty jamu. Free transport in Ubuda area. Every day I get terrible stiffness, but after I had massage here my body stiffness completely relieved. I felt good during the massage and fell asleep. Both my feeling and body got relieved.